Click on any of the program covers to learn more. 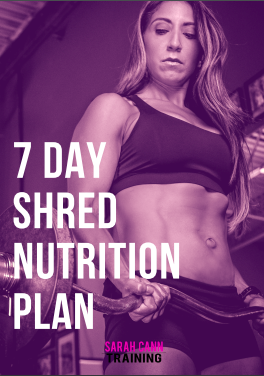 I’ve created a 7 Day Nutrition Plan full of simple delicious menus to help you kick start your progress and get ready to implement the nutrition strategies of the CHISELED Program! This nutrition plan has CHISELED approved recipes, a grocery list, sample meal plans and lots of information about carb cycling, intermittent fasting and macro counting. This program was designed to get you bikini ready FAST. The training plan includes HIIT, plyometrics, weight training, and circuit training. Essentially, the complete package! The program also includes my detailed 7 day carb depletion strategy that is guaranteed to get you shredded. Combine the nutrition with these workouts and you WILL see results. * Includes a 7-day meal plan. ALL TRAINING PROGRAMS JUST $49 THROUGH JULY 31ST! This is my best selling fitness program. This plan is perfect for beginners and those working out at home. You'll receive 6 weeks of workouts that can be completed at home with minimal equipment in about 30 minutes. You also receive an easy to follow sample menu to maximize results! If you've mastered bodyweight workouts and are ready to start incorporating resistance training, this 6-WEEK program is for you. This program is an introduction to the weight room and various pieces of gym equipment. You will gain confidence on the gym floor by incorporating resistance training and HIIT style cardio 5 days per week. You will shed fat and build lean muscle using this introductory weightlifting program. Are you bored with traditional workouts that follow the same sets and reps each week? Are you ready to learn more challenging strength moves? Do you want to increase your strength while still dropping excess fat? This 8 week plan is the program you need for building muscle, increasing strength, and seeing results. This plan challenges you with a progressive lifting schedule and you'll finish each session with a fat burning cardio conditioning circuit. Access to a gym or home gym is recommended. Add a Custom Macronutrient Nutrition Plan to any ebook purchase for just $30! Add custom macronutrient goals to any of my ebooks to maximize your success! Each person has a different goal and starting point. It is important to have a custom caloric amount so you can better reach your fat loss goals. Many of my clients have been under-eating or eating the wrong portions for years! Once they receive a custom breakdown to follow, they see results faster and in most cases, are eating more calories than ever before. Enjoy your strongest happiest pregnancy ever with this twelve week training program! Are you a Mom-to-be who wants to continue your fit lifestyle throughout your pregnancy? If so, this is the plan for you! Staying fit throughout pregnancy is so important and will help to reduce the negative symptoms of pregnancy. Continuing a prenatal workout routine in all three trimesters will help prevent excess weight gain, keep your body strong for labor and delivery, and significantly speed up the recovery process (not to mention the health benefits to the baby). GOT QUESTIONS? COMPLETE THE FORM BELOW AND I'D BE HAPPY TO HELP!